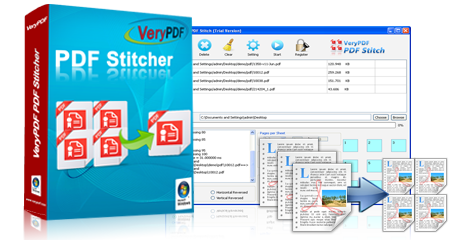 VeryPDF PDF Stitcher is designed for stitching multiple PDF pages to one PDF page. You can buy a proper license for your Mac or Windows version. Each software package contains both GUI and CMD application. How to cut or split one PDF page into several pages? Try with VeryPDF Advanced PDF Page Cut. How to print several pages to one page (1up, 2up, 4up, 6up, 8up, 16up)? Try with docPrint Pro.